Above middle: CH Adam Albertus, bred by us, in the show ring. 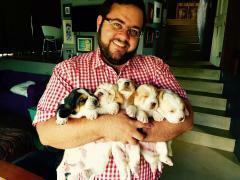 For any further information, more pictures, references from owners who bought puppies from previous litters, bookings, or to come and meet the family, please contact us. Ons antwoord graag enige vrae, so kontak ons gerus! 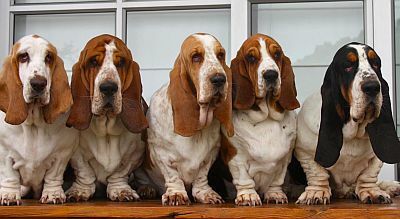 Once you have had a basset hound you will never have another breed again, you will be “bassefied”! 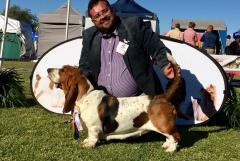 We are exhibitors and breeders of KUSA registered Basset Hounds and Spinone Italiano, breeding selectively and responsibly, so puppies are only available occasionally to pet and loving show homes. 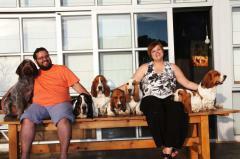 Our hounds live with us in and around our home and our puppies are raised accordingly. The pups are played and interacted with on a daily basis, with each one receiving individual attention. By the time that they leave for their new homes they are emotionally mature and well socialized. We are located in Gordon’s Bay, Western Cape, South Africa (close to Cape Town), but travel arrangements for flights to other locations can be made. Puppies can also be transported to other countries. 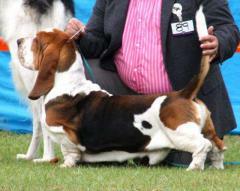 CH Hester Moravia Bray of Bassefied (aka Hester) is imported from the Moravia Bray kennel in Czech Republic. She is the queen in our home. 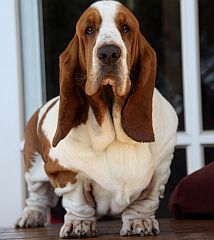 Our imported boy, CH Fanfan Orvisnik of Bassefied (aka Frank or Fannie), from the Orvisnik kennel in Slovakia, is a gentle giant and a real casanova. CH White Whoopi van Grunsven of Bassefied (aka Whoopi or Bekkie), is imported from Holland from the world renowned van Grunsven kennel. She is soft natured and loves to play with tennis balls. Our big boy, CH Rabbithunter Rocco van Grunsven of Bassefied (aka Rocco) joined our family in 2015 from Holland. Affectionately called Jodie Bear his nick name tells you all about his nature, he loves to cuddle. Bassefied Dete (aka Princess Dete The Magnificent) is our home bred girl. She is a special one, getting away with much more than the others do. 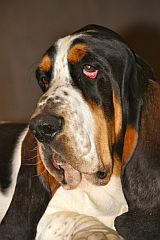 CH Smart Lady od Berounky of Bassefied (aka Ivah) is imported from the od Berounky kennel in Czech Republic. Also called Bokstert she is the clown in the house, with so much love to give. 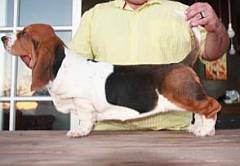 In addition to her stunning temperament she is also a great show dog, with several titles including KUSA National Basset Hound 2018. From our F-litter we kept Fransiska (aka Sissika) and she loves to chase our cat, Mia Meraai, who rules the entire household. 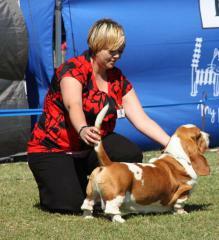 Our bassets are actively shown and achieve under local and international judges. They descend from well-known European bloodlines. Our puppies will be dewormed regularly, will receive all inoculations required until they leave for their new homes, have a micro-chip implanted, and receive vet check-ups and a vet booklet. 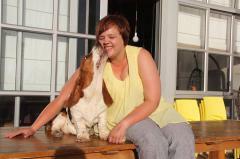 Puppies are registered with KUSA (Kennel Union of Southern Africa) under the KUSA registered affix of Bassefied. Breeding restrictions are placed on all our puppies, but these can be discussed and lifted in certain selected cases. We prefer pet puppies to be spayed/neutered and undertake to assist new owners with these costs. We ask all new owners to sign an agreement of purchase. Rabbithunter Rocco van Grunsven of Bassefied, imported from Holland. 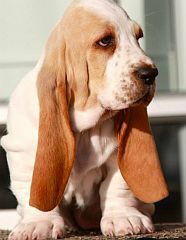 CH Hester Moravia Bray of Bassefied as a puppy, imported from Czech Republic.